Under the heading ‘Give Help Without Publicity’ in his journal Sanathana Sarathi October 2003, p. 295), Sathya Sai Baba said in a discourse after an earlier speaker had spoken extensively about the achievements of the Sai hospital: “I always advise the doctors not to publicise what we do in the hospital. There are several wonderful things that are happening.“ [All Sai Baba’s words are in italics] Whereupon he goes on at great length about supposedly marvellous achievements of the hospital in two individual cases! This yet again shows the complete discrepancy between Sai Baba’s word and deed within the space of two sentences. He knew too that this went out through huge loudspeakers set all around the ashram, and that it would be printed and air-mailed to tens of thousands, posted on various of his official websites and also sent out repeatedly on his own world-wide radio! What a pathetic parody of true spirituality! His wily chutzpah, evident to the level-headed, does not penetrate the thick cocoons of blind faith in which so many devotees imagine themselves protected from untruth. ‘Give Help Without Publicity’ is completely hollow hypocrisy. Sai Baba’s braggaddocio about his loving selfless service – literally claiming it to be thousands of times more than anyone else does seems overdone from one who claims to be the father and mother of all beings, the creator and sustainer of the universe! The Sathya Sai Organisation and many of his followers parrot him without ever a twinge of criticism in countless articles, books galore, on dozens of websites, in films (often exhibiting public service by his followers), in repeated photo exhibitions (to which all centres in the world have to send details and pictures of service activities), in constant self-serving radio broadcasts (Radio Sai) and in hiring the most expensive venues in big cities (New York, San Francisco, London, Melbourne etc.) to propagate and propagandize beyond all decency. Sai Baba also mentioned about boys nightly sharing his bedroom, as he has previously stated is a fact – one which is also well known to ashram residents and regulars. He said: “These boys from the hospital sleep on the ground floor while I stay on the first floor. They discuss hospital related matters. I keep telling them, ‘Do not speak about them anywhere outside’. ” Yet he had just sat through one of these boy’s long glowing account of the achievements of the hospital! Such brazen duplicity shows Sai Baba’s strong desire to have information about ‘His‘ hospitals spread loud and far. The official Radio Sai website – run by his trusted follower and cover-up agent – Dr. G. Venkataraman – trumpets such propaganda continuously. In that discourse, Sai Baba also waxed large about having personally allowed the use of an injection costing Rs. 80,000.- to save one patient’s life. He said, “Any amount should be spent to save the life of the patient. I shall bear the expenses…“ Yet how indeed can he pay out of his own pocket, who has no pocket? Using such huge sums on single injections is virtually an affront to the millions of poor in India who can’t even afford the simplest proper medicines or treatments. His super-costly and over-opulent hospital buildings declare rather much the same message. He also said: “One patient from Nepal had his heart on his right side! Our doctors have shifted it back to the correct location. I told the doctors that no one needed to be informed about this. People may accuse us of praising ourselves.“ But it is he who praises himself and informs about it as publicly as he can! When hypocrisy becomes so transparent it is a parody of the balanced truth. Further: “Thousands of students have received education in our university totally free of cost. But we have never publicised the fact.” Thereby he unrepentingly blazoned it! It is NOT true that he has not publicised this before. It has been mentioned constantly in discourses and in many interviews. Further, several people who have applied and were asked to pay fees – or were expected to donate accordingly – have disputed the truth of this. The SSSIHMS, Puttaparthy (Sathya Sai Institute of medical Sciences) is but a relatively modest contribution to the massive health problems in India, especially for the peasantry. of the peasant populace. The close servitor of Sai Baba – a veteran and prestigious Goenka prize-winning economic journalist V.K. Narasimhan – told me he considered it to be a huge waste of the money donated, rather being a flagship to promote Sathya Sai Baba himself and his various eclectic doctrines. VKN thought the money could have been better employed as prophylactic medicine and out-patient clinics for huge numbers of the poor, such as in ensuring that all received necessary vitamins and simple medicines, rather than in performing a limited number of very high-tech. operations. Narasimhan was slowly weaned from his original scepticism because of the praise and attention Sathya Sai Baba poured on him (he was very prone to flattery as an old age widower), taking him on a tour of the wards. There has, however, been public controversy about its clinical cleanliness and claimed results, especially by Sara Pavan – a doctor who left his post in Australia to work there but who came into conflict with the principal of the hospital and was suspended. The degree of filth found and the re-use of old syringes were among the reasons given for strictly avoiding becoming a patient there. It is not open to independent health inspections by regulatory bodies, nor are its admissions made available as it is a private undertaking. It provides services to Sathya Sai devotees in India and from abroad (who visit for the purpose of operations etc.) and who either donate or are charged with a bill. It is reported – and certainly likely that this hospital’s services are permitted to persons who Sai Baba wishes to bring into his fold. “Many sit here near to me. But are they dear? There are scorpions and snakes near to me in Puttaparthi. Are they dear? No!” (Sathya Sai Speaks new ed. Vol. 25. Ch 9, p. 94). Perhaps he was (also) referring to the many who wished to get some kind of sinecure or benefit from the hospital – like free accommodation, who would not have waited indefinitely for this… but that is rather a far-fetched reason for such a huge waste of resources involved in letting a major complex stand empty and unused for so long. Around 1800 GMT today (April 4. 2011) there are media reports () such as on NDTV that Sai Baba’s condition is critical. The grapevine from India conveys to me that his body is not responding to any treatment, and some say he is dead already. One source says he died during heart surgery. All this may well be rumours… but I have predicted that – as Sai officialdom always does – the facts have been glossed over by Dr. Safaya and all the other believers in Sai Baba’s omnipotent powers. Sai Baba’s condition has been critical and doctors have had to ‘fight to save his life’. Whether they are successful or not time will show, but it is a sign, perhaps, in that the vultures are gathering already: the nephew of his deceased younger brother Janakiramiah, one Ratnakara,(TIMES OF INDIA) is according to my informants trying to take control of the Sathya Sai Central Trust and even to ‘step into Sai Baba’s shoes’! The Sathya Sai Central Trust has also reportedly obtained signatures from at least two of Sai Baba’s relatives (Deccan Chronicle). (One usually well-informed contact we have reports that this was possibly under false pretenses. According to his information, they thought they were signing permission for doctors to operate, but the actual wording may also have involved their handing over any rights they may have had to dispose of Sai Baba’s massive financial empire. The truth of this report cannot be guaranteed, but it may help to stimulate any officials who could investigate the matter). UP-DATE A recent report from various Sai ‘authorities’ is that Sai Baba’s condition has stabilized again and that he is showing sings of some improvement. One must evaluate this on the background of the turmoil surrounding the doctors and officials who have even been attacked by suspicious and fanatical devotees trying forcibly to get immediate access to Sai Baba (who is in intensive care still on a respirator and continuous dialysis!). Yesterday we could read on Bernama.com: “He continues to be on CRRT (Continuous Renal Replacement therapy) system to help functioning of the kidneys. “The vital systems are not adequately responding. 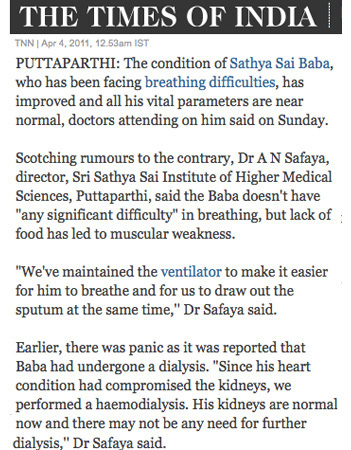 The condition of ‘baba’ is critical,” said Dr A. N. Safaya, director of Sri Sathya Sai Institute of Higher Medical Sciences in Puttaparthi. This shows that one dialysis was not enough, it has to be continuous. So much for all the tricky talk about ‘Sai Baba is better’. The fact is: Sai Baba is worse… if actually still alive. Time will tell. Another report from NetIndian states: “The doctors’ team was still attending on Sai Baba to save his life, he said.” This is evidently getting closer to the truth. Perhaps the authorities’ policy is to break the news slowly, bit by bit? See also sify.comHe continues to be on CRRT system to help the functioning of the kidneys,” a health bulletin issued by the Director of the Sri Satya Sai Institute of Higher Medical Sciences said. “The vital systems are not adequately responding. The condition of Baba is critical. The panel of doctors treating him are doing their best to make the system to respond,” it said. No doubt the devotee director of the Sri Sathya Sai Institute of Higher Medical Sciences, Dr. Safaya and other devotee doctors, put a positive spin on what came out so as not to alarm the many who were praying at the ashram. I suggested that would be done, knowing how censorship of information by his minders is always used and how Sai Baba says always to look at everyone and everything through rose-tinted spectacles. The Sai Baba coterie has always had a very tight control of all factual information – especially much so since the many allegations of wrongdoing emerged on a massive and increasing scale since 1999 when David Bailey first opened the can of worms. Believers in the literally megalomaniac claims by Sai Baba (God Incarnate, Deity of all Deities, Creator of the Universe etc. ), as his ashram, hospital and college staff have to be, will always be unable to see the facts relating to him as they really are unless forced to in some cases by emergencies they must face themselves, as in this case. Judging by the current international media, the world at large is relatively unaware of Sathya Sai Baba and his unsurpassed claims of ultimate greatness and superhuman divine powers, or his grip on the minds of the highest leadership in India. Not so in India, where only the most courageous journalists and news media dare ever publish anything negative about this power-broker and his cadre. It is high time for a reassessment of the claims of Sai Baba, now that his repeated prophecies about his own invulnerability to aging and health problems have exploded, leaving him wheelchair bound, degenerating visibly and even blubbering when praised with the words ‘Sri Sri’ at his own birthday (he has previously decried crying as something one should do under no circumstances – as reported by his VIP devotee Jegathesan see here). One can pity him for his condition, but not for his deceits and abuses. About rumours – spread widely and wildly by Sai people, though not by most critics, see here.